Energy Management Collaborative (EMC) announced today its top four utility performers for 2017. The lighting and controls company, which works with hundreds of utilities, based its criteria on important factors that impact program success for its customers including preapproval timelines, rebate values, payment timelines, trade ally bonuses and overall savings. A Minnesota energy non-profit that promotes energy efficiency to strengthen the economy while improving the environment, CEE was an excellent resource for project incentives for smaller footprint customers operating under 400 kilowatts. CEE incentives lowered costs for about 20 customer projects in 2017. "Drawing a straight line between opportunity and efficiency is what we do," said CEE Lighting Consultant, Mark Rader. "In our mission to help Minnesota businesses cut energy use, we're fortunate to benefit from great partnerships serving our shared customers." The Illinois-based utility provided excellent preapproval and payment timelines for a large volume of work EMC completed in 2017. Working with ComEd, EMC successfully obtained its Certificate of Service Authority from the Illinois Commerce Commission, which grants service authority to operate as an Installer of Energy Efficiency Measures in the State of Illinois. Participation in Eversource's Trade Allies program made it easy for EMC to stay competitive in the race for limited rebate dollars. The utility also kept EMC informed of when funds were running low to ensure customers in Massachusetts used what had been approved for them. The high incentive dollar savings and their collaborative approach make Eversource a utility partner EMC immediately looks to work with whenever a customer has locations in their territory. Retail and industrial customers significantly benefited from the incentive savings delivered from these projects. Many of EMC’s lighting projects are for multisite retail locations. For those that fall within Xcel Energy’s service areas, they expedite preapproval times and streamline the application process, enabling EMC customers to apply for the project as a whole, instead of filling out individual applications for each location. In 2017, despite plans to cut an LED tube rebate, Xcel Energy reserved some of these funds for a large retail customer, significantly offsetting their LED lighting project. 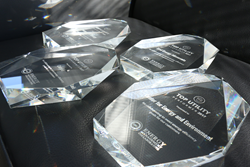 This is the second consecutive year Xcel Energy has been named an EMC top utility performer. Energy Management Collaborative (EMC) provides energy efficient Lighting + Controls + IoT solutions for a broad range of multinational retail, commercial, industrial and government clients. Since 2003, the company has used its proprietary project management approach, EnergyMAXX, to successfully implement turnkey lighting upgrade projects, saving clients over 3.5 billion kilowatt hours of energy.